Globally, the oral healthcare market, is the one with the greatest growth potential. 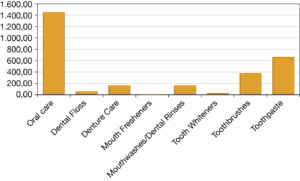 The field of oral care includes a plurality of products, the most representative are the toothpaste, toothbrush, mouthwash and denture care, of these, the first two are the ones with the largest market share, hence the new products which are developed mainly belong to these types because they represent, for companies in the sector, the fundamental drivers to compete. The toothpaste market is the largest, representing a market share of over 55% and is expected to grow to $ 12.6 billion by 2015, at a compound average growth rate of 3%. All this is due to the growing consumer awareness of the importance of good oral hygiene, a nice smile and fresh breath are part of the image that conveys a person. For this reason, conjunction with increased spending power resulting from rise in per capita income in emerging economies, are the factors that affect the growth of the field of oral care. It shows no signs of growth, rather it is very stable as a whole. Euromonitor International, in the country report of June 2015 «Oral Care in Italy» provides a snapshot of the situation. 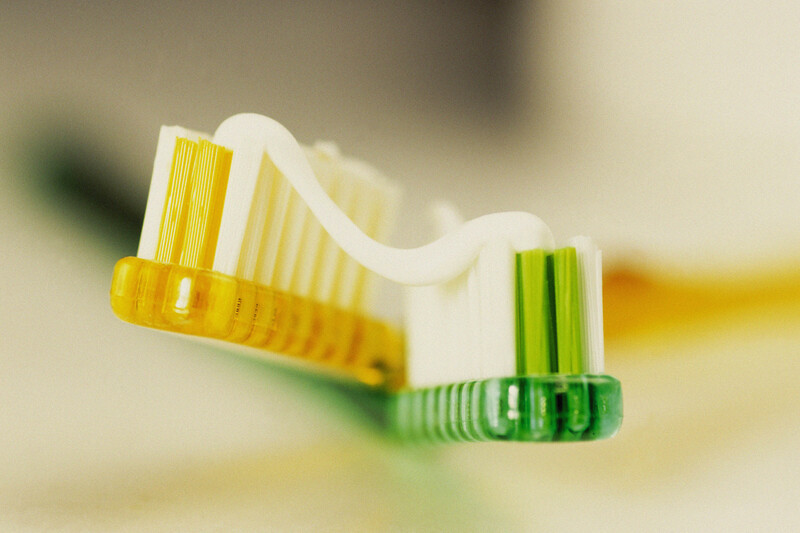 Italian consumers are sensitive to oral hygiene and seek performance products, but without forgetting the convenience. Despite the crisis remained stable in the last year, Italians, even in a difficult time like this, they realized how good oral hygiene is important and helps to prevent problems in the oral cavity, moreover oral hygiene is experienced with a positive approach, associated with feelings of well-being, freshness, self-confidence. Unlike other European countries, the italian welfare system does not guarantee dental care and the private system is expensive, italians try to take care of their teeth postponing the visits to the dentist. 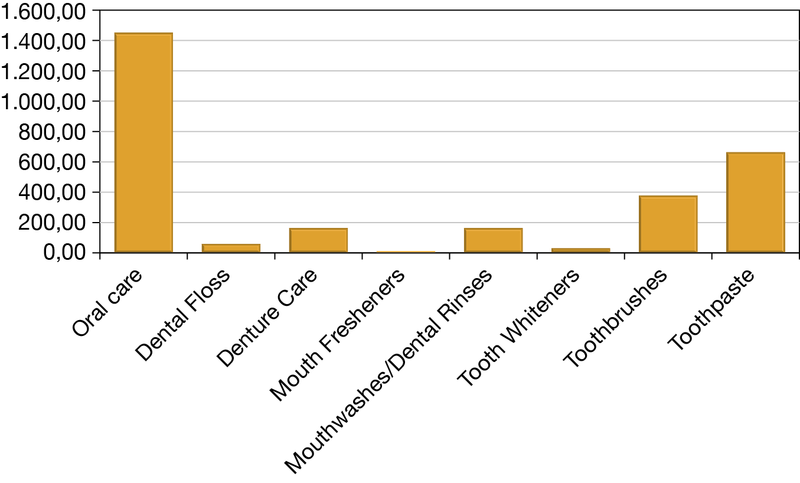 The oral hygiene market in Italy was generally stable, in the period 2013/2014 the sector lost 0.3% overall. But as shown by the figure 1, there are many differences in the categories within the market. 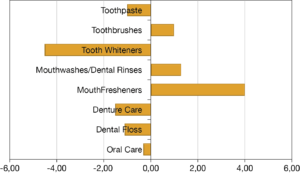 The subcategories that, during the period, showed a positive trend are toothbrushes (+1%), mouthwashes/dental rinses (1.3%) and, surprisingly, mouth fresheners (4%), which records a portion of sales is very low, so it does not affect the overall trend of the market. But, in light of what we said above, the result should not be surprising. Mouthwashes are the category with the greatest potential, and grow as the value and volume of the market, but penetration is still low. 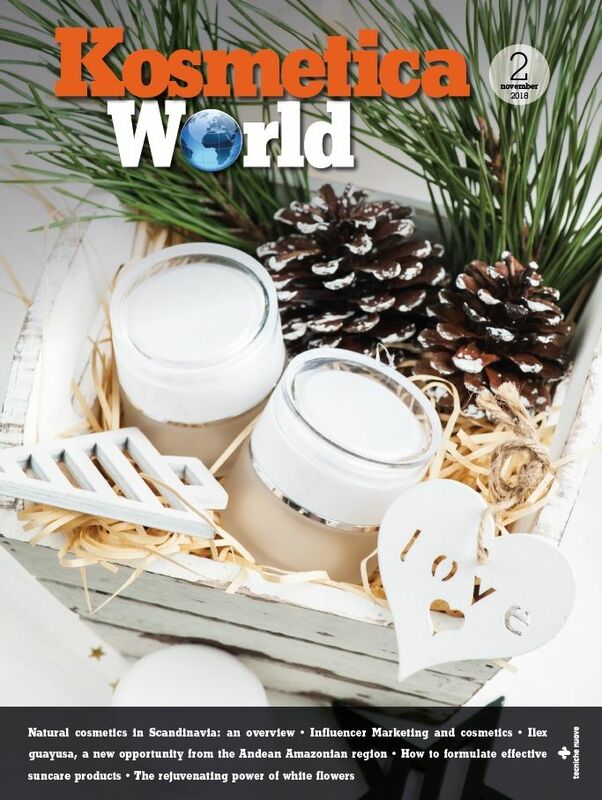 Again, according to Euromonitor, in sector toothbrushes, subcategory electric toothbrush, and globally recorded a compound average growth rate of of 4% in the period 2009-2014, Western Europe accounted for 79% of global absolute volume growth, led by France, Germany and Italy. A contribution to the dissemination among consumers of electric toothbrushes is provided by product and by device updates, these developments have stimulated consumer interest. 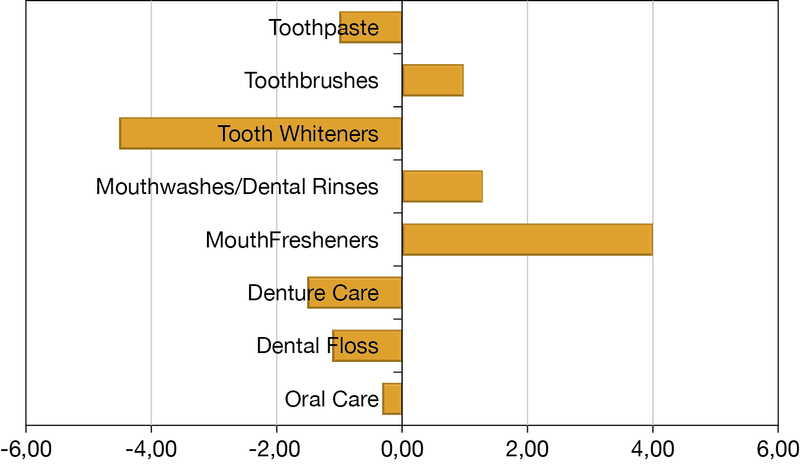 Meanwhile, the categories that showed negative performance, during the years examined, are: dental floss (1.10%), denture care (-1.5%), toothpaste (-1%) and tooth whiteners (-4.50%), the latter category cover a negligible share of sales and have performed particularly negative. The area that we are examining is static, total sales in Italy confirms the turnover of the previous year, practically zero growth. Most of the business still develops in supermarkets, but there was a slight decline in sales. It confirms the positive trend of the pharmacies that reach good results. The drugstores has the breadth of assortment, the latest market news and product prices affordable, but will now have to compete with discount stores that have begun to enter on the shelves, also products of the market leaders and followers of the top market, in the categories personal care and home care. The oral care market is mature, with penetration index almost total; the type of product is the main driver of purchase, such as anticaries, for a fresh breath, antitartar toothpaste. The brand is seen by consumers as a guarantee of reliability and the price a reference to of choice. A core enabler for this market is the rate of innovation necessary to revitalize the demand and to increase value-added products. In support of their brand, companies create communication plans media which include an important part of digital, as well as TV commercials and a range of activities at pharmacists and dentists. The collaboration with professional associations, to propose periods devoted to dental health, are part of the marketing strategies. Unilever Italia, with the brand Mentadent, is the most known of oral hygiene between Italian consumers, representing a market share of 13% in 2014, followed by Colgate with 8% and AZ from Procter & Gamble Italia with 7%; The expected improvement in economic conditions will drive the growth of the sector, but will, however, negligible values for the next two years.